According to a recent article published by the Hill, the Healthcare industry workforce shortage has reached long-term care. In what used to be a more adequately staffed market, Minnesota has seen the vacancy rate for personal care aides reach 14 percent, which has led families to rely more on each other for care. In some cases, these family members may even have to quit their jobs to take care of loved ones. With the aging Baby Boomer population, direct-care workers like home health aides and nursing assistants have never been in higher demand. With demand at an all-time high, long-term care organizations report that it’s getting increasingly difficult to recruit and retain quality talent. This is something that is true across a variety of long-term care settings. 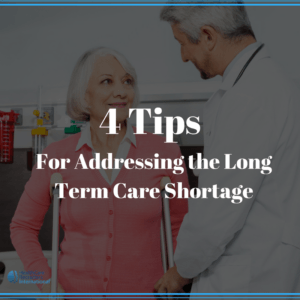 Below, we’ll look at our recommended tips for addressing workforce shortages within your long-term care organization. Because the workforce shortage is not expected to significantly improve in 2018, it’s critical that you have a game-plan and recruiting strategy in place as the new year approaches. Often overlooked, your job postings can have a big impact on who is attracted to work at your healthcare organization. If your posting is weak or you set up the wrong expectations, you may actually end up deterring potential candidates from pursuing a career at your company. Ensure you’re being honest about what the job entails, as you’ll be more likely to connect with well-suited candidates if you are. Go through your current job posts and double check that they’re accurately describing the role available. It’s critical that you’re clear about what the job requires and what type of person may be the ideal fit. If your application process isn’t streamlined, you may be missing out on potential candidates. An overly complicated application process filled with unnecessary steps or overlap can discourage potential candidates from applying for a job. It forces candidates to spend excess time that they most likely don’t have filling out several pages of information. To avoid missing out on candidates before they even finish the application process, be sure to streamline your application process. Don’t be afraid to get creative with your sourcing. You may have to look into unexpected places to find the talent you need in the midst of a shortage. While the internet and social media provide a lot of candidates, you may need to look towards job fairs, trade shows, networking events, or partnering with local academic institutions to keep your pipeline healthy. Branding is critical to attracting talent. Without a memorable brand, what is to separate your organization from the next generic long-term care organization in the eyes of job seekers? Without branding, it’s a challenge to raise awareness about your company too. When candidates don’t know who your company is, they’re less likely to recognize you or seek out opportunities. Additionally, they’re less likely to make a valuable word of mouth referrals to qualified friends. You can leverage community events, digital marketing, thought leadership, and social media outlets to promote your organizations and the benefits of working there. Be sure to highlight the appealing aspects and include something about your current employees’ positive experience. Just because there is a workforce shortage, doesn’t mean your organization needs to suffer. With the proper plan and tactics in place, you can ensure that your organization is properly staffed going into 2018. If you need help attracting, sourcing or vetting talent, HCRI has been placing top healthcare professionals for over 25 years. We are one of the most recognizable brands in the healthcare recruiting industry, and we can help you if you need it. If you’re in need of a new long-term care or other healthcare hires, please contact us.